Songs and dances are effective awareness tools. These two mediums, often used to entertain, communicate and transmit culture, have a strong appeal to the public, particularly at the community level. Through such performances people are not only entertained but also get to learn a thing or two. 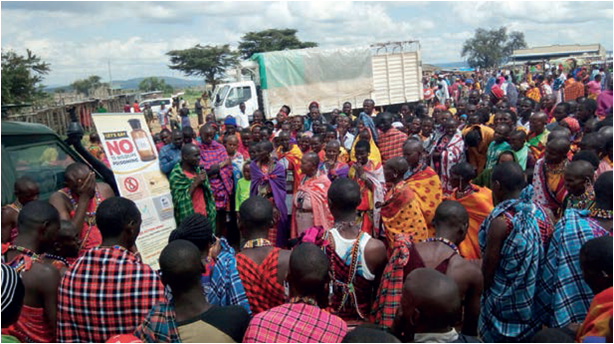 An awareness campaign aimed at sensitizing communities on the dangers of wildlife poisoning through song and dance took place in Maasai Mara in June. The outreach, involving shows by a troupe of traditional Maasai artists named the Buffalo Dancers, staged a series of public performances at seven markets in seven days. Using songs, choral chants and drama the performers visited Ngosuani, Naikarra, Ewaso Ng’iro, Olpusimoru, Nkeneji, Oloolaimutia and Aitong markets, delivering powerful anti-poisoning messages aimed at discouraging the public from engaging in retaliatory wildlife poisoning. The markets were targeted as key venues for the performances since they serve as meeting points for people from various areas seeking to exchange livestock and purchase food. Unlike holding public meetings in villages and manyattas, the performances attracted huge crowds, leading to a higher rate of message transmission. Members of public thronged venues where the performances were held, some of them even recording the proceedings on mobile phones to share on social media platforms. Gauging by its popularity, it appears that the outreach is having a positive impact as an awareness tool. Over 6,000 people were reached through the awareness campaign that was undertaken jointly by Nature Kenya and the Mara Predator Conservation Programme. Nature Kenya is implementing the “Saving the African Vulture” Project in the greater Mara Ecosystem. The project seeks to reduce poison related vulture deaths as a contribution towards the halting and long-term reversal of vulture declines in Africa.